Marquette, Mich.—USA Wrestling and Northern Michigan University have announced that Andy Bisek has received the new title of Associate Head Coach for the NMU-OTS Greco-Roman program. During his two years with the NMU Olympic Training Site, the team has seen 13 athletes earn spots on the Junior, Senior and U23 World Teams. Bisek was also named as the coach for the 2017 and 2018 U23 World Championship teams. The NMU squad also earned over 50 international medals including a gold-medal finish by Alex Sancho at the 2017 Grand Prix Zagreb Open and a second-place finish by Dalton Roberts at the 2018 Grand Prix of Germany. Roberts competed on the 2018 U.S. Senior World Team, which recently competed in Budapest, Hungary. “Andy Bisek continues to do a great job at Northern Michigan. It is a reflection on how hard he works and how passionate he is in helping athletes to achieve their goals. We are honored to have him with the NMU-OTS program and as part of USA Wrestling’s Greco-Roman staff,” said Matt Lindland, National Greco-Roman Coach. Before coming to NMU, Bisek was a National Team member for USA Wrestling and competed at the 2016 Olympic Games in Rio de Janeiro, Brazil. 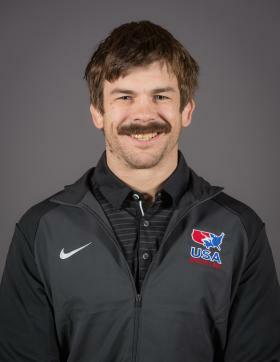 Bisek won bronze medals at the 2014 and 2015 World Championships, bringing home the only Senior Greco-Roman World medals for the United States during the four-year Olympic cycle. He also won gold at the 2015 Pan American Games and the 2012 and 2014 Pan American Championships. He is a four-time U.S. World Team member, and a two-time U.S. Open champion. Bisek was named USA Wrestling Greco-Roman Wrestler of the Year in 2014, 2015 and 2016. Bisek was a U.S. Olympic Training Center resident athlete for a number of years. Previously, he attended Northern Michigan University himself, and was a member of what was then called the U.S. Olympic Education Center Greco-Roman program, where he developed into one of the nation’s top young Greco-Roman wrestlers. He is a native of Chaska, Minn., where he placed third in the 2004 Minnesota State High School Championships. Bisek will continue to work with NMU-OTS head coach Rob Hermann developing the program, which continues to provide talented athletes a high-quality Greco-Roman wrestling environment while pursuing a college education.